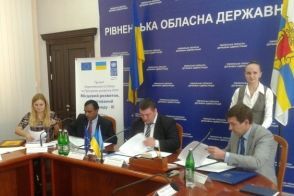 Third phase of the EU / UNDP Community-Based Approach to Local Development (CBA) Project was launched in Rivne region. The launch event gathered together regional and local authorities, civil societies, private sector and media to discuss cooperation for promoting community-led local sustainable development further to improve the living conditions of people. The event took place on 29 September 2014. Distinguished invitees of the official launch of CBA third phase included International Project Manager of EU/UNDP Project “Community Based Approach” Jaysingh Sah, Monitoring and Communication Specialist of EU/UNDP Project “Community Based Approach” Svitlana Slabinskat, leadership of rayon state administrations and rayon councils; and heads of village and city councils. "I am sure, that every rayon of the oblast would like to join the project and to reach their targets, as the self-realization of local communities is one of the key tasks we should reach in terms of the third phase. 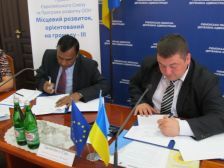 In its turn, oblast council do its best to make this cooperation fruitful. Cooperation with Project is important for regional authorities and we will show that we can and willing to work jointly with local communities. Next year we will also add costs to budget for cofinancing project initiatives which will help to implement project tasks effectively", mentioned Mykhaylo Krylov in his welcoming speech. In its third phase, CBA project will strengthen capacities of regional and local authorities to practice participatory governance, as well as intensify community-based approach in Rivne region. CBA activities will focus on rehabilitating basic social and communal infrastructure in the priority areas of energy efficiency, health, environment and water management together with promoting small farm and non-farm businesses in rural areas. It will support the Ukrainian Government in developing policies in the area of decentralisation and share innovative approaches and good practices on participatory governance and community-led local sustainable development through knowledge hub and the curriculum of twenty regional universities. Implementation of the first phase of CBA Project commenced in Rivne region during February 2008. First phase was succeeded by a second phase in July 2011. Over these two phases, 97 800 men, women and children of the region have benefitted from improvement in 64 schools/kindergartens, 23 healthposts, 3 water supply, 6 street-lightning and so on. This happened through joint effort of the citizens, oblast/rayon/local level governments, CBA Project and the private sponsors.